"Your only as good a warrior as they hear you are." Ruckus is perhaps the most aptly named warrior on the Maximal team. 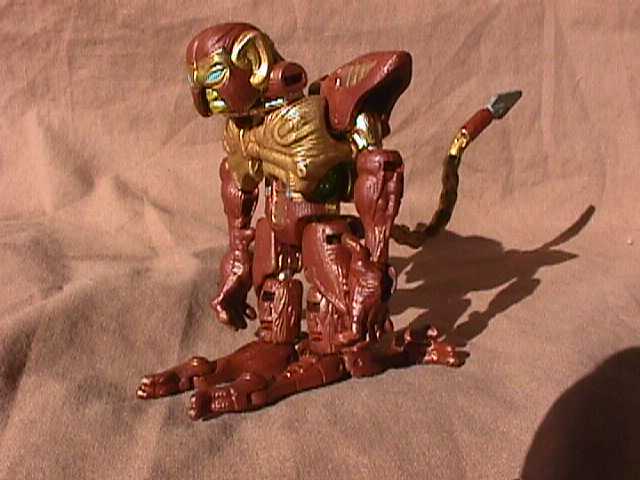 Whenever he's around, be it in the deepest recesses of the jungle, or the depths of the Maximal base he makes enough noise to make you believe he's a dozen Maximals instead of just one. In the jungle this is done for that reason exactly, to fool Predacon units into believing an entire squadron of Maximals are assaulting them instead of him alone. At the base, it simply amounts to the fact that Ruckus no longer recognizes the difference between his battle cries and his normal voice. None of his fellow Maximals can be in the same room with him long enough to explain it either as his voice shorts out their audio receptors after a few minutes. This may be the reason he's assigned to so many long term missions in the wilds of the jungle. In ape mode his agility is unmatched, especially as he swings among the canopy of the jungle depths. For his second mode, his legs split apart to form a pair of hover skis which he can use for a limited form of flight. 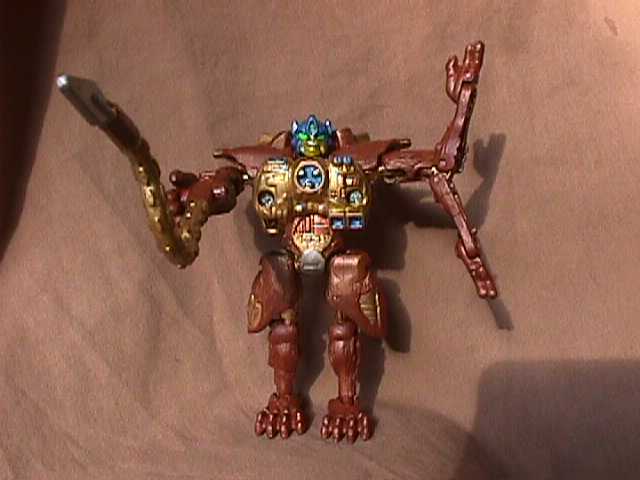 In robot mode, his tail becomes a hand held hookshot. 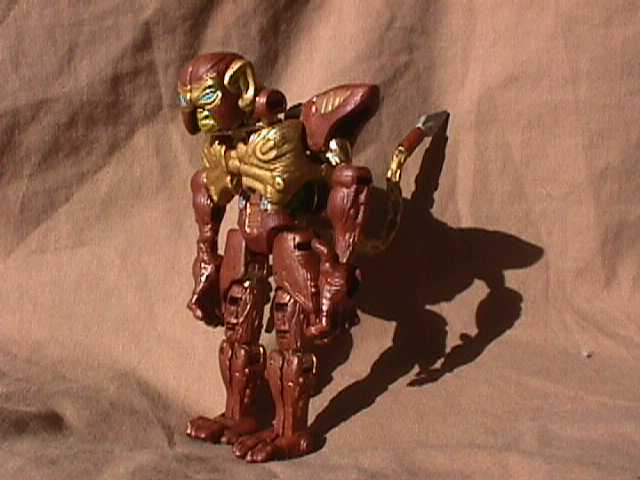 A blade attached to a long chain that can be used as either a whip, shot out at high speed to embed itself in a tree for swinging, or into a Predacon to keep him from running away when Ruckus shoots his chest mounted gating gun at them. He's also a specialist at cyberteka, the Cybertonian martial art skill involving multiple arms, which he achieves by splitting his forearms apart.